SUV or wagon? Are these different family-hauling options truly cross-shopped on merit? Ordinarily not. Buyer preconceptions tend to sway preferences strongly towards one body style or the other on the premise, rightly or wrongly, that SUVs simply don’t drive as nicely as wagons, or that a wagon plainly isn’t as commodious or practical. It’s a decision made before a foot is set on the showroom floor, with beelines made towards foregone preferences without a glance sideways at the alternative. That’s because SUVs and wagons are nothing alike, right? Not necessarily. Car-makers – notably the ever-prolific Germans – are diversifying the breadth of their ranges while drawing from an increasingly unified component set. More and more commonality creeps in, not merely in form and flavour but in terms of what they’re like to use and drive. Take one car-maker from Stuttgart, with its vast model matrix, and you’ll find non-identical twins. The evergreen Mercedes-Benz C250d Estate and the recently launched GLC250d 4Matic both have the brand cache, both are medium sized, both are equally premium in aspiration and fittingly high in specification level, both adopt auto-equipped turbo diesels, and the list goes on. They’re achingly similar packages despite differences in the packaging itself, inside and out. Or are they? What we want to discover is how similar, or indeed different, these two are once you load up loved ones and hit the road. Yes, the GLC comes with an extra sheen of modest soft-roadability and trip-to-the-snow versatility, maybe. But in blending luxury-laden comfort and family-friendly utility, which, if either, is a better fit for the everyday sunburnt Aussie experience? And can the wagon fulfil all that the SUV promises, and vice versa? It mightn’t be a surprise that the C-Class wagon, which asks for $69,990 before options and on-roads, is the more affordable of two. Especially given that both of our test cars are in high-spec 250d trim. But that the noticeably larger – well, taller, at least – GLC-Class SUV wants for just an extra $3000 (list price), or less than a five per cent premium, may raise an eyebrow. Dropping down to entry diesels in the C200d Estate ($64,900) and GLC220d ($64,500) and just $400 separates wagon from SUV – perhaps a stoush for another day – though this pits a 100kW/320Nm 1.6L diesel versus a 125kW/400Nm 2.1L in a powertrain face-off clearly favouring the SUV. The parity here, though, is that both 250s adopt the same 150kW/500Nm 2.1-litre turbo-diesel four, though both through different automatic transmissions and number of driven wheels (more below). Not surprisingly, much is shared between them in their ‘250’ specification level. Standard equipment across the board includes a lift to leather seat trim (up from man-made Artico ‘leather’ in lower-spec Cs and GLCs), three-colour ambient lighting, an auto-dimming rear-view mirror, Benz’s entry-level ‘Audio 20’ infotainment and sat-nav via a 7.0-inch screen display (including touchpad control/single CD unit/digital radio), both Bluetooth and various hardwired device connectivity options, electric park brake, keyless-go and entry, dual-zone climate control, a leather steering wheel with shift paddles, rear tinted privacy glass, adaptive cruise control, heated and folding wing mirrors, a reverse-view camera and parking sensors front and rear, and electric tailgates. You really have to look closely – the slightly more ‘monochromatic grey’ GLC (pictured above) features a little less alloy and piano black detailing than the C (pictured below) – to find any disparity in the level of presentation. Further, both are fitted with speed-sensitive electric power steering, a suit of five drive modes, passively damped Agility Control suspension and run-flat tyres, though the GLC sits on 20-inch wheels (to the C’s 19s) and exclusively offers a 360-degree camera system, with various view modes, and the multi-functional LED Intelligent Light System headlights with adaptive high-beam assist not fitted to the wagon. Each gets the excellent Driver Assistance Package Plus as standard, which adds steering assist and a suite of advanced active safety, such as blind-spot, cross-traffic and lane keeping assists and pedestrian recognition in the clever Pre-Safe braking system. So far, so thoroughly similar. However, half a dozen CarAdvice colleagues were asked to climb aboard both to relay their cold, immediate impressions, and almost everyone agreed the C-Class felt more upmarket. “It feels a class above,” one said. The reason can mostly be attributed to the optional AMG line package added to the wagon, which introduces a blend of ash wood and alloy trim inserts, adds more heavily bolstered sports seats, a rich-feeling flat-bottom wheel, and eye candy such as stitched Artico on the dash top and door and centre console touchpoints… before you factor in the 19-inch AMG wheels and body restyling. The lift in presentation alone, it must be said, is an extra $2685 very well spent. Both our cars had an optional Vision package (adds a panoramic roof and head-up display, plus high-spec LED and adaptive high-beam to the wagon) and all-singing-and-dancing Comand infotainment package (including Burmeister sound), but it was the C250d Estate alone that got Airmatic adaptive air suspension ($1915) and a seat comfort pack (heating, memory functions, an added $992). Thus optioned, our wagon lists for $89,210 plus on-roads, against a markedly more affordable $77,227 list price for the SUV. The C-Class does rack up an extra $3000 of LCT but, well, them’s the breaks on the showroom floor. Whether by measuring tape or visual impressions, the wagon is longer (by 46mm), more slender (80mm) and has a markedly lower roofline (182mm). However, the SUV is longer in wheelbase by just 33mm (2873mm v 2840mm), and the wagon’s whopping 120mm extra rear overhang suggests a longer cabin if you combine passenger and luggage space. Running a tape measure through both cabins is a less genuine impression of accommodation than climbing and feeling the ambience. No surprises, then, that the wagon has more lower-slung seating, is a little more awkward to climb in to, shoulder room is tighter and head space a little less airy. That said, with the front-row seats adjusted for good under-thigh support, headroom is more than ample, and outward visibility is excellent even for shorter drivers or if the seat is fully lowered. The SUV is easier to climb into…if you ignore the shin-bashing sidesteps that wont likely aid entry or egress for anyone other than young children. Its 182mm of extra vehicle roof height doesn’t translate directly to cabin headroom, as the ride height, floor and seats are all higher than with the wagon. That said, the GLC has more shoulder and elbow room (around 50mm for both), feels a little shorter for legroom (though it technically isn’t) and has airier ambience. One issue some drivers may have with the GLC is outward vision. The front seats are set much higher than the wagon (Benz quotes 347mm versus the wagon’s 286mm ‘static’ floor-to-squab height), so even taller drivers may lower the seat dramatically to comfortably reach the pedals. Thus set, even with my 180cm frame, you sit so low that the leading edge of bonnet disappears from sight, making it hard to see out of and a little difficult to judge its extremities, particularly when parking. Because of this, the GLC’s exclusive 360-degree camera, then, is less a nicety and far more a necessity. The wagon, in contrast, not only proves a more natural driving position but offers much superior all-round vision. Those optional AMG seats, too, are more comfortable than the GLC’s less-shapely front buckets, which more than one CarAdvice pundit found required incessant adjustment in the search for long-haul comfort. The second row of the wagon offers decent head, elbow and shoulder room, though both knee and toe room are limited compared with the SUV. Whip out the tape measure and GLC has modest but noticeable space advantage in key areas: 35mm more knee room, 30mm more depth from squab to floor, 31mm more height squab to roof lining, 38mm more hip room and just 13mm more shoulder room. The last measurement is telling. While the wagon would struggle to haul three adults in the rear in comfort, the 13mm-wider GLC is ostensibly no better off. Ideally, then, either is ideal for the mid-sized family – two adults, two kids – and it’s remiss to presume you’ll fit more volume of loved ones in the GLC-Class than you will the C-Class. Conversely, while our healthily optioned C250d presents more aesthetic panache than our lesser-endowed GLC250d, they function near identically. 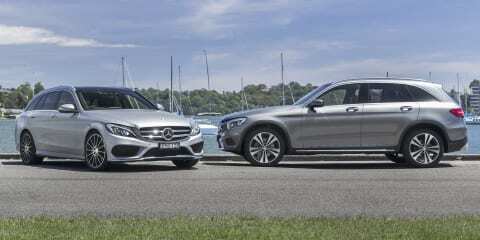 Cabin space and comfort, technology and connectivity: both C- and GLC-bodied Benzes in ‘250’ trim have rated well in past review, and neither of our test cars here deviate in any substantial way from past form. You have to dig down to door bin or glovebox sizing – the wagon’s are both smaller – to find any useable or practical separation in the pair. Neither is without criticism. The infotainment interface isn’t to everyone’s tastes, can be a little slow to react to inputs, and when the metal console controller is left exposed the Aussie Summer sun it becomes incredibly hot to touch and takes forever to cool down, and their climate control systems’ fans can be, at times, annoyingly loud. For sheer cargo volume, the GLC takes an on-paper win. With its 40:20:40 split-fold rear seating in play, the SUV’s 550-litre capacity is 60 litres up on the (490L) wagon, and the 1600-litre volume seats folded (kinda sorta) flat is a 90-litre advantage (against 1510L). However, these are differently shaped storage spaces with different sets of pros and cons. The wagon has a much lower floor height (590mm high versus 720mm) and is noticeably deeper in length (1035mm against 930mm), though quite a bit narrower in width than the SUV that, with its high cabin ceiling, offers a little extra load height (808mm plays 795mm). Unless your payload conforms perfectly to the SUV’s cargo area dimensions, there’s not much practically difference between the two in how much stuff you’re able to haul. Out tip is: for carrying bulky objects, the wagon has a better load height. For a makeshift baby changing table, the SUV’s floor space is at a less back-breaking height. Both, handily, offer remote rear seat fold-down switches in both the second row and cargo areas. Neither carries a spare wheel, with each offering underfloor storage, though the SUV’s is larger in volume and, unlike the wagon, the latch mechanism is lockable. Worth a mention, too, is that both come standard with roof rails offering 75kg maximum load ratings. As mentioned, both of our protagonists adopt identical 2.1-litre turbo-diesel fours outputting 150kW at 3800rpm and 500Nm between a narrow 1600-1800rpm window. They do, however, go about different methods of drive, and many buyers will consider that the GLC’s three-grand premium is amply compensated for by drivetrain hardware. The SUV adopts a nine-speed 9G-Tronic automatic transmission and permanent all-wheel drive, whereas the C250d uses the marque’s time-honoured seven-speed 7G-Tronic auto driving the rear wheels only. At 1845kg, the GLC-Class is substantially heavier than the 1660kg C-Class. The direct penalty is two-fold: not only the is wagon (6.9sec) swifter to march to 100km/h from a standstill than the SUV (7.6sec), but with its remarkably frugal 4.9L combined consumption figure, it’s claimed to drink 0.8L less across a leisurely 100-kilometre jaunt. Given the similarities covered to this point, it’s fair to presume the trend would continue closely in the driving experiences. Not entirely so. The wagon isn’t merely the swifter device, it’s also nicer and more user-friendly across the balance or normal driving. Neither powertrain is a pillar of refined smoothness, but the wagon is more effortless off the mark, more eager to march when required, and the seven-speed transmission is a more silken operator, if only because it’s less burdened at moving mass. The SUV’s engine feels more strained more often, and its nine-speed a little more grumpy and thumpy during mundane commuting. You’d presume that the nine-speed would stack its ratios more closely than the seven-speed, but it doesn’t appear the case. It seems to rarely reach beyond seventh – often sixth – unless you’re cruising at speed with a light throttle, oftentimes, only after many kilometres. Result? Harbouring two extra ratios, in this application, doesn’t make for a finer, more-refined driving experience. These extra cogs likely come to the fore at autobahn speeds. The harder working SUV was thirstier, though not by much, returning low nines round town to the wagon’s low eights, well short of their respective 5.7 and 4.9 claims. However, hitting the open road for extended stints using cruise control returned markedly more favourable performance, with numbers (low sixes) approaching Mercedes-Benz’s combined-cycle claims. Both cars offer comprehensive drive mode suites allowing adjustment and individualised settings for engine/drivetrain and steering tuning, though it’s only the wagon, with its optional Airmatic Agility suspension, that allows ride tuning between soft Comfort and firmer Sport settings. Selective damping is available for the SUV, via an Off-Road Engineering Package, but as our GLC doesn’t have it fitted its unfair to critically deride the larger Merc against the smaller stablemate here for what is patently the less disciplined ride and handling package. The GLC is at its best on the move, be it on the highway where it’s quiet and settled, or through a high-speed sweeper, where it’s surefooted and secure. The C-Class covers all of this – it sits flatter, offers significantly more body control, and adds a degree of driver engagement the SUV patently lacks, not necessarily engagement as fun but engagement as confidence. The wagon’s ride has more measured compliance across rough surfaces, and around town it irons out imperfections and negotiates sharp speed humps. At low speed the GLC-Class pitches and wobbles on its softly set suspension more noticeably and, across severe bumps, doesn’t settle quite as quickly. In the company of other premium mid-sized SUVs, the big Benz may well be a class act, but against its more lithe stablemate it’s not as nice to drive, not as cosseting for its occupants and isn’t nearly as easy to negotiate urban rabbit holes with. That the SUV is tougher to judge, place on the road and park are the most tangible downsides in day-to-day ownership experience. The all-wheel-driven and slightly higher riding GLC does present more multi-surface flexibility, but you do pay extra for the Off-Road Engineering package’s broken surface addenda (dedicated drive modes, underbody shielding, hill descent control, et al) and, given the standard fit 255/45 20-inch road rubber, adventures are realistically limited to paths not terribly beaten. Which includes the challenge of finding snow chains to fit the GLC’s monstrous rolling stock. Both cars are covered by Mercedes-Benz’s three-year, unlimited-kilometre warranty, with 24-hour emergency roadside assist offered for the duration of the new car warranty. The C250d Estate’s service intervals are 12 months or 25,000kms, whichever comes first, capped at $396 for the first service and $792 for two subsequent visits. The GLC250d follow the same schedule, but asks a further $100 for the first 12 months/25,000kms service ($496) and following two intervals ($892 apiece). That the wagon is more affordable to service and a little more frugal on fuel gives the C-Class the nod in the ownership stakes. Both are five-star ANCAP performers. Hardly crucial but worth a mention is that the C250d Estate allows a mix and match of 10 body colours, four (18in-19in) wheel styles, eight upholstery and four interior trim selections. Meanwhile, choices available for GLC250d includes 11 paint colours, five (18in-20in) wheel styles, three interior trim and five upholstery schemes. On balance, the wagon received a more positive response among the CarAdvice staff who sampled both vehicles. And it was generally subjective opinion, rather than objective judgement with which underpins our ratings, that polarised opinion most. Design drew much commentary. One colleague described the GLC like a “prestige car that had a been Xeroxed too many times, losing its premium-ness in the process”. Indeed, when the S-Class design was robbed blind for the current C-Class, it brought a newfound freshness to the upmarket mid-sized sedan and wagon segment. That the GLC in turn robbed C-Class down to fine detail has left the mid-size SUV feeling a little seen-it-all-before, a new segment challenger dulled somewhat from being a bit predictable and Benz-by-the-numbers. Being something of a ‘safe haven’, though, ought not affect the GLC’s ratings here. Further, the point of this ‘range comparison’ isn’t to assign a winner and loser among the cars tested. Indeed, had another GLC250d with air suspension and interior upgrades been pitched against a lesser-enhanced C250d Estate, and the sizeable price-as-test disparity swung the opposite way, we’d be no closer to deducing a win and loss. Nor does being a little fitter in spec in areas – nicer headlights, soft-roading smarts – hand the pricier GLC much of a value advantage when so much elsewhere is so similar. Instead, we were keen to test preconceptions about choosing one body style over another. And here’s what we found. Is it any less practical to opt for a mid-sized wagon against and similarly sized SUV everything else being (roughly) equal? Absolutely not. Do medium-sized wagons and SUVs built from common stock offer indistinguishable driving experiences while only really differing in interior packaging. Again, definitely not. Would we take the C-Class keys over the GLC-Class? Indeed we would.